Listen up! I read about this retired nurse called Joy who can detect some diseases by smell alone. This wasn’t some “Elvis on the far side of the moon” headline grabbing malarkey; Joy is the real deal. Research scientists ran tests on her and she correctly detected patients who had been diagnosed with Parkinson’s disease just by smelling their t shirts, what we have learned from Joy allows us to create, scent based, early diagnoses tests. 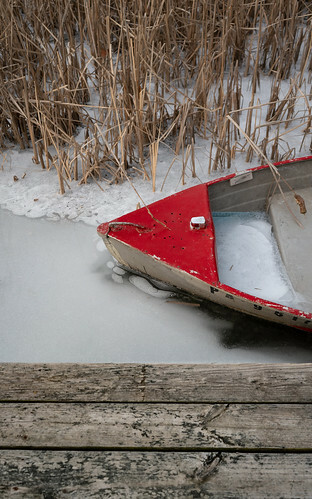 All well and good you might think, but what does this have to do with this photograph of a red boat trapped in ice? Well, I would argue that we can smell this picture. There is less for the nose to work with when the ground is snow, the lake is ice; and the odour molecules of a frozen deck are moving so slowly. You might have to take my word for it. When I look at this picture I can faintly smell spring in the air. Look hard, inhale… it is almost here.